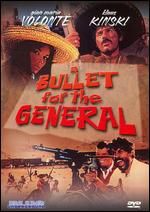 Emiliano was a Mexican revolutionary general and just the type of guy you would think Marlon Brando would be interested in portraying. And guess what... So it happened. Check out Viva Zapata! from 1952. 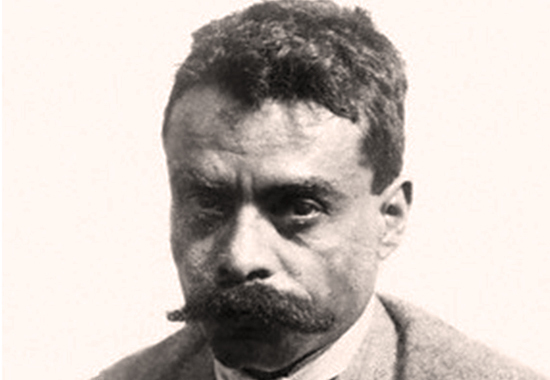 Emiliano Zapata led the peasants of southern Mexico in the Mexican Revolution. His slogan was Tierra y Libertad, or Land and Liberty. In a nutshell, Zapata wanted the land that the huge hacienda owners had snatched from the peasants restored to them. Historians describe Emiliano Zapata as a skilled guerrilla warrior, an excellent horseman, and a very humble person. Only few could match his ability to ride long distances and few could equal his skill as a rider. It is also said that Zapata was shy and reserved, that he avoided personal glory, and that he could've become much more powerful, if power would've been what the man was after. Zapata's quiet assumption of power won him respect. With a solid mustache, Emiliano Zapata was a tall man, although not as tall as Pancho Villa, which you might find surprising, but Pancho was rather on the beefy side, so there. Matching Zapata's physique was his voice - thin and high. Zapata was efficient and honest. The man was no fake and that was one main reason for his popularity. 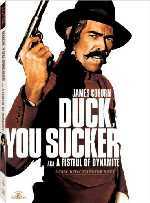 So what if it sounded funny when he spoke, soft spoken Zapata was never a friend of many words anyway. When he did speak, his words were smart and to the point. 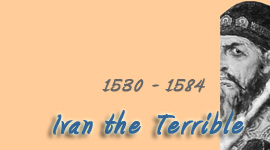 A true peasant in the best sense of the word, Emiliano loved the land and was ready to fight for it. What was Zapata's principal personality trait? Some people say it was his pigheaded stubbornness. Others say caution was a prime characteristic. Zapata looked always neat as a pin. Some interpret his style and choice of wardrobe as arrogant and cocky. Others say, he was merely dressing like any other typical village chief, who would wear his best clothes. In any event, Zapata had the reputation of being fair, cautious, yet forceful and resolute, a man who always kept his word. Toward reporters Zapata was always polite but rather uncommunicative. He felt uncomfortable in the presence of politicians and preferred the company of ordinary villagers. And it is said that Zapata had a good sense of humor. The issue in Emiliano's days was land grabbing. The big plantation owners tried to absorb all the land there was without exception, leaving high and dry the people who formerly lived off the land. Thus, haciendas were suffocating villages. Many people didn't have any other choice than becoming a resident labor (gente de casa) who permanently moved onto a hacienda. 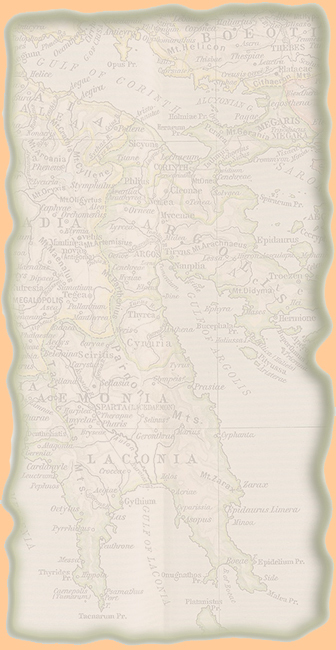 By the way, what was produced on the plantations? Mexico's main products were sugar, rum, and rice. In Morelos, Zapata's home state, the rural leaders reacted against the expansion of the sugar estates. Emiliano Zapata's father was Gabriel Zapata. He was a horse trainer and dealer. Of horses, that is. Gabriel Zapata was considered an expert when it came to horse training and breeding. 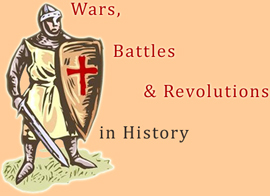 Gabriel's brothers were Cristino and José, who fought against France in the War of the French Intervention. Emiliano Zapata's mother was Cleofas Salazar. Cleofas' father was José Salazar, who fought against Spain in the Mexican War of Independence. Cleofas' brother was León Salazar, who in turn had a son named Amador Salazar Jiménez, who was also a busy revolutionary. When living off the land became insufficient, the Zapata Salazar family started to sell and purchase animals and to specialize in small livestock breeding. This gave them some independence from the Hacienda del Hospital, which was the big sugar plantation that dominated the area. At the age of 16 Emiliano lost his mother and 11 months later his father as well. 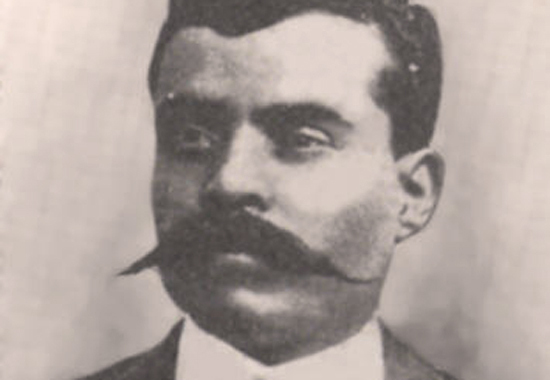 One of Zapata's brothers was Euphemio Zapata, who was six years his senior. Euphemio was gunned down in the streets. Check the timeline entry. Emiliano was 31 years old when he married Josefa Espejo, the daughter of a livestock dealer in Villa de Ayala. By that time Zapata already had one child by another woman, Nicolas. Josefa spent much of the time with her husband, always quiet and keeping in the background. Emiliano Zapata had approx. 5 more illegitimate kids. Zapata lived 39 years. 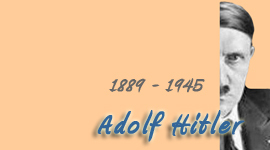 He was born in the tiny peasant village of Anenecuilco, Morelos, which featured at the time around 90 houses. A stream of the same name, Anenecuilco, ran through the village. Most villagers were employed on the haciendas. They worked as farm hands, functioned as slaves, and were officially treated as serfs. Following in his father's footsteps, Zapata became a horse trainer. 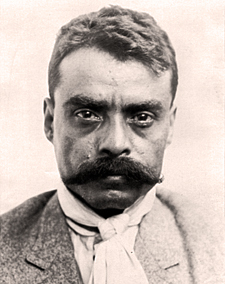 Aged 26, Emiliano Zapata was one of the representatives for his village. The occasion? The residents of Anenecuilco and Villa de Ayala asked for a meeting with the governor of the state Morelos, Manuel Alarcón, as well as with the manager of the Hacienda del Hospital in order to bring the peasant's desperate situation to the attention of these men. The meeting did not bring any solution. In the elections for governor of the state of Morelos, Zapata supported the independent candidate Patricio Leyva, who ran against President Diaz' favorite, the hacienda owner Pablo Escandón. Escandón won the elections. The year? 1909. The town elders of Anenecuilco elected Zapata to defend the villagers' right to have their own lands and to get back what had been stolen. 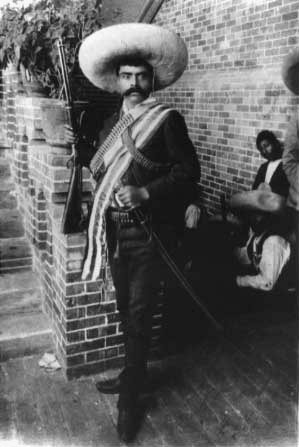 This put Emiliano Zapata officially on the governmental blacklist and he was force-drafted into the federal army. Emiliano joined the Ninth Cavalry Regiment with headquarters at Cuernavaca. His commander was Colonel Ángel Bouquet. Ignacio de la Torre y Mier was the owner of the Tenextepango Hacienda, as well as the son-in-law of Diaz, which always helps. Ignacio arranged Zapata's discharge and hired him as his chief groom and horse specialist at his Mexico City stables. Emiliano did not last long in this position and decided to return to his town, where the indifference of the government hadn't change a thing in favor of the peasants. Quite on the contrary. Generally, the problem of the hacienda owners was that they didn't hear well when peasants tried to talk to them. Thus, Zapata and his men took action. They re-took the lands by force, and distributed it among themselves. The lands in question were llano de Huajar, Anenecuilco, Villa de Ayala, Moyotepec. The date? Mid 1910. Zapata and approx 80 armed men marched to the fields they had recently been kicked off from by the Hacienda del Hospital management. 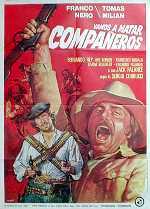 When Zapata and his friends appeared, the hacienda guards and the farm hands cleared out. The Hacienda del Hospital administration was gnashing teeth and demanded rent from the Anencuilco farmers, who refused. Brought before a judge, a ruling was issued in favor of the farmers. Zapata sent a letter to President Diaz, who also backed down. Soon, other villages followed the Anencuilco example. 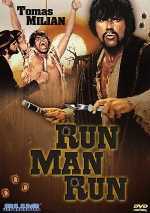 But Zapata and his men still saw the need for change on a higher level. When Francisco Madero announced his Plan of San Luis Potosí, Zapata and his men couldn't agree more and decided to fight on Madero's side. It worked. Old dictator Porfirio Díaz resigned, appointed foreign secretary Francisco León de la Barra as interim president and Zapata's new problem became . . . Madero. Zapata asked Madero to arrange for the hacienda owners to restore the lands to the peasants. Madero, now caught between many chairs, said No. Instead, Madero offered Zapata money to buy some land. Madero also told Zapata to lay down his arms. Madero meant it and Zapata took it to heart. Emiliano Zapata announced his retirement, went home, and got married. However, things did not improve even after Madero was officially announced president. Action oriented Zapata therefore came up with The Plan of Ayala and declared the Revolution back in full motion as the main objective hasn't been met yet. Zapata had high hopes in Madero. But he quickly realized that Madero would not keep his promises regarding the return of the lands to the peasants. Zapata therefore thought up a plan that would replace Madero's Plan of San Luis Potosí. A plan that would express the social goals of the Revolution and that would serve as guideline and principle for all future revolutionary actions. Although able to read and write, Zapata appreciated some academic help. This help materialized in the persons of Otilio E. Montaño and José Trinidad Ruiz. - Contrary to earlier thinking, Madero is not the man who can bring about the goals of the Revolution, i.e. return of the lands. - Therefore, the Revolution is recommenced with full force. - The goal is to set up an interim government until free elections are possible. - Land should be restored to the peasants. Moreover, all lands formerly belonging to the big haciendas should be distributed among the people. The haciendas can keep a third. Haciendas that don't accept this rule get nothing. Here you can read the English translation of The Plan of Ayala. Why was it called The Plan of Ayala? Because Zapata had his headquarters close to Villa de Ayala. 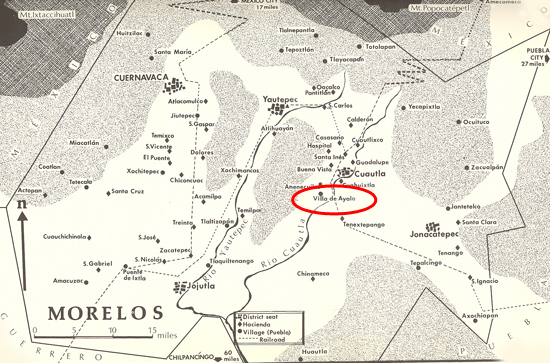 Check the map below, Villa de Ayala is located in the state of Morelos and you can find it just underneath / left of Cuautla, pretty much center of the map. Zapata meant what he said and expropriated as he went and executed if he had to. Here and there things gotten out of hand but basically Zapata and his men stayed true to their declared goals. 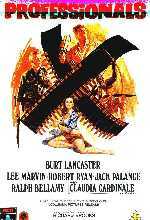 The idea of guerrilla warfare is to avoid open battle. Thus Zapata ambushed the rich, the national institutions, and the federal army wherever and whenever possible and thus supplied his men with food and ammunition. It went reasonably well for Zapata. The peasants who received lands started working on it, keeping their arms within reach. However, Zapata had trouble going from guerrilla harassment to open warfare, which would have been desired in order to bring in a lasting victory. Equally annoying for Zapata was that his army constantly lacked trained soldiers and sufficient ammunition. Always suffering from a severe shortage of equipment, it was impossible for Zapata's men to hold the towns they had taken for any length of time. General Victoriano Huerta overthrew Francisco Madero and made himself president, or rather dictator. Zapata wasn't fond of this concept, he wanted an elected president. 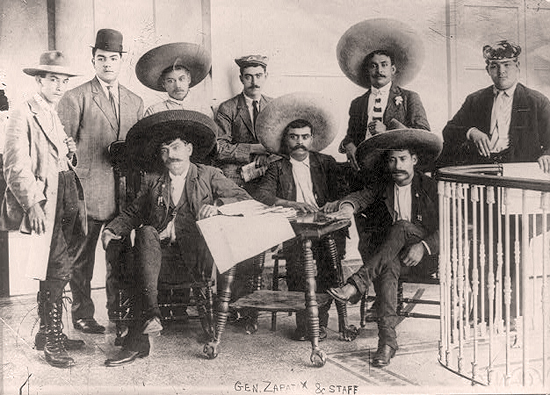 Hence Zapata joined forces with other revolutionaries, such as Pancho Villa, and supported Venustiano Carranza for president. Carranza was surrounded by a decently numbered following himself, also known as the Constitutionalist Army. Together they succeeded. Huerta was exiled. The Zapatistas and the Villistas wanted General Eulalio Gutiérrez as temporary president until elections could be held. The Carrancistas wanted Carranza as president. Fighting broke out. who were the Villistas and the Zapatistas. In his neighborhood, Zapata reorganized and put reforms in place. 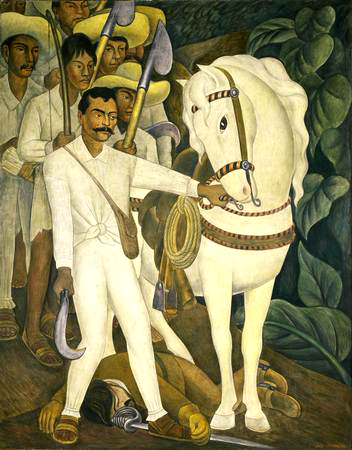 He became the Agrarian Leader, which also was the title of a painting by Diego Rivera. came on his horse wasn't invited. Things went downhill when Carranza forces defeated Villa in 1915. Zapata managed to re-organize his home state Morelos and people were fairly content with their lives there. One thing Zapata didn't accept was military officers who interfered in village affairs. Zapata refused to organize a state police. He thought that was the obligation of each individual village council. 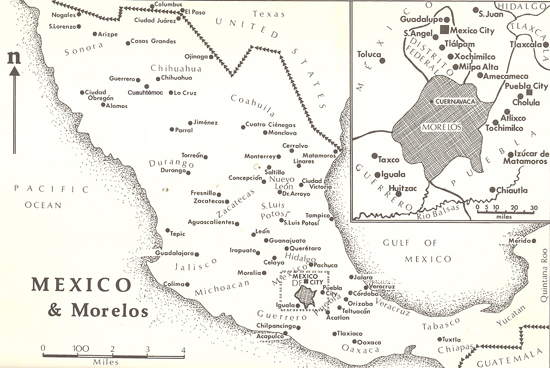 All in all, life improved but these changes only covered the Morelos area, which prompted the people of Morelos to seek independence from the rest of the country. And there was no way the rest of the country would let them do that, of course. By 1917 Villa was finished. Carranza became the official president and completely ignored Zapata reform and reorganization wise, which was a shame because Zapata had already managed to set up order and justice within his surrounding area, thus proving that The Plan of Ayala was indeed practical. Among others, Zapata's generals were: his brother Eufemio Zapata, Genovevo de la O, Francisco Pacheco, and Gildardo Magaña, who became Zapata's successor. Carranza wanted Zapata gone for good, and he put General Pablo González in charge of this task. González suggested an ambush. Some say Zapata let it purposely come this far. These people argue that Zapata acted completely out of character, completely against the advice of his aides, and completely against the reports of his spies. 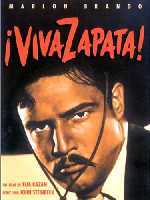 Throughout his career, Zapata constantly urged caution. The man was suspicious by nature. Check the entries in the timeline of the Mexican Revolution. Zapata's loyalty for his countrymen and their right to posses their own land. For this right he would fight anybody without compromise. Emiliano led an army, the Ejército Libertador del Sur, or Liberation Army of the South, fought a guerrilla war, and looked competent while doing it. His men paid him respect. At its peak, the Liberation Army of the South consisted of about 25,000 troops. Some say Emiliano was a ruthless revolutionary. 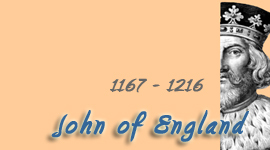 Others refer to the fact that he always tried to keep his men civil. When they entered a city, they humbly went from door to door asking people for food. Yes, there were some incidents of ruthless behavior, the Zapata supporters argue, but it was a revolution, not a picnic. Largest sombrero in town, Emiliano Zapata in an interview with journalists. Morelos 1914 - 1919. Clip of Zapata's funeral at Cuautla, Morelos. More or less authentic. 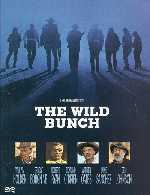 Excellent Western Classics!